No images of Electroy Pty Ltd Installations. Solargain almost won my business. Rather unfortunately, their rep decided to wait until I'd contracted with another supplier before offering his best deal - one which I would have accepted had I not already signed a contract. The main advantage of Electroy over the other suppliers who quoted is their "10 year unlimited warranty", with call out within 48 hours. They extend the manufacturers' warranties on inverter, panels and racking system. I have heard that ABB can be pretty slow at repairing or replacing inverters under warranty (see Whirlpool, for example). Electroy confirm that they will replace the inverter and take away the faulty inverter for repair or replacement with ABB. 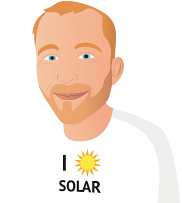 Another installer confirmed that if it took 3 - 6 weeks for ABB to replace or repair the inverter, that's how long I would be without solar! No comparison. No choice. If Electroy's guarantee stands up, then I won't be able to fault them. Their sales rep was very knowledgeable, yet deferred to engineers when unsure of the answers, unlike other reps who either brushed over important technical queries rather than getting a technical answer, or really didn't know much about the systems they were selling. Electroy installed within a week of contract and in one day for a 6.25kW system, for $8000 (to include a "free" 25th panel, WiFi logger card and surge protector, plus some additional electrical work on the house - a benefit of going with an electrical- rather than just solar-contractor). They also informed me of two local properties on which they'd installed systems, to enable me to check their work and customer satisfaction. Still do not have Solar Power turned on 5 weeks after installation. They did not submit paper work and no excuse or apology for not be prompt with submission. Although they took our money quickly. We were originally looking at some air conditioning for our new home, Electroy followed up with us and suggested we also have a look at the solar. With a small pool and air con we already figured the new house would be using more power than the old one. We were surprisingly impressed by the sales guy (Dave), He took the time to find out about us and what we wanted, very easy to talk to. Dave was polite, knowledgable, professional and able to answer all our questions in plain English. He seemed to genuinely care about our situation and that we understood what the technology was, how the technology worked and how to maximise savings. We looked at a couple of other firms but Dave was the most credible and least salesey. A background check on Electroy and the recommended equipment (Yingli & Aurora) confirmed what we had been told. Not the cheapest but we felt additional value was there, wanted quality and we decided to go ahead. Very pleased with the installers, I was a bit unsure whether the 24 panels would fit on the northern roof, but it looks great. The install was completed in one day - real neat. They showed me their work and how to the read the inverter (which is next to my meter box). Friendly staff and easy to talk to. The team at Electroy did an amazing job with installing my system. Everyone was very professional and took no time at all with the installation of my solar panels, they also explained the process with me before installing the system so i could understand everything that they were doing. Electroy in Brisbane are not a big Solar company but a leading electronics company in Brisbane. Their price was one of the best around and I also found (and independently verified) that they do installations for most of the larger companies that I received quotes from. That is what they were doing when they made the decision to start selling their own systems. Excellent service and follow-up. Since they were around before the boom in Solar and that is not their only income source, I have confidence that they should be around long enough to help out with any future problems that I may have. Thanks for your email, the system seems to be working very well as you can see below. We are very happy with your company and we will recommend you to anyone without hesitation. We did a lot of research beforehand and Electroy was our early favourite on paper and the first company to visit us. We are a working class family living in a basic house in the scrub and most sales consultants from other companies looked down their noses at us. With one 'hard sell' salesman we actually had to insist that he leave, we have experienced every kind of person from "used car salesmen' to "limousine salesmen"
Honestly, it was a time consuming and complex process which at times made us want to give up due to the lack of integrity/honesty we experienced. What we wanted was pretty straight forward, a good system at a reasonable price installed by good people. Sean Singh was a pleasure to deal with and gave us clear information and was polite and courteous to us. He gave us good customer service, good advice, good options and a fair price on quality hardware. Once we paid our deposit everything went like clockwork. We were very pleased to get a phone call from Troy, confirming the installation date and communication with your office has exceeded our expectations. The installation guys did an excellent job and worked very hard all day and left everything clean and tidy and were also very pleasant and courteous. I was up on the roof a few days later to put our tv antenna back up and to have a look and was very happy with the quality of the workmanship and cleanliness of the work area. The after sales service from your company has also been excellent and its very refreshing to find a company that cares about their product and their customer after the bill is paid. To Troy, Sean, Sarah and all your team, Thank you for a positive experience.